We’d love your help. Let us know what’s wrong with this preview of Unsinkable Faith by Tracie Miles. For many people, remaining optimistic and feeling positive about themselves and their lives is a constant battle—especially when circumstances are difficult and life is hard. For others, negativity is something that only sneaks up from time to time, yet still wreaks havoc in their hearts. Regardless of the root causes, once pessimistic thoughts permeate our minds, our feel For many people, remaining optimistic and feeling positive about themselves and their lives is a constant battle—especially when circumstances are difficult and life is hard. For others, negativity is something that only sneaks up from time to time, yet still wreaks havoc in their hearts. Regardless of the root causes, once pessimistic thoughts permeate our minds, our feelings and emotions begin to control us instead of us controlling them. Eventually it doesn’t seem possible to stay positive, happy, and full of joy, and negative thought patterns shake our faith, causing us to sink emotionally, mentally, and spiritually over time. But it doesn’t have to be that way. Despite what storms roll in, hearts anchored in God don’t sink. When we change the way we think, we can change the way we feel and live, even if our circumstances remain the same. Intentionally embracing the opportunity to experience a transformed heart and a renewed mind opens the door for a changed life, because a positive mind will always lead to a more positive life. To ask other readers questions about Unsinkable Faith, please sign up. I really enjoyed this book because it reminds readers that everyone is struggling with something in their lives. Throughout the book, the author shares a variety of stories, each one describing a difficult situation that someone has gone through and then gives practical ways of dealing with different emotions. In each chapter there is also scripture listed that goes along with that particular topic. The author also provides stories about herself throughout the book. Some of the topics the book c I really enjoyed this book because it reminds readers that everyone is struggling with something in their lives. Throughout the book, the author shares a variety of stories, each one describing a difficult situation that someone has gone through and then gives practical ways of dealing with different emotions. In each chapter there is also scripture listed that goes along with that particular topic. The author also provides stories about herself throughout the book. Some of the topics the book covers includes learning to replace pessimism with positive thinking, learning how joy and happiness are based on choice, how to overcome negative thinking and learning how to stop feeling hopeless and start feeling hope filled. I believe that the topics the author talks about in this book are something that most of us can not only relate to, but would all also benefit from making some of these positive changes. The book is broken down into 10 chapters, each focusing on a different topic. At the end of each chapter there are two sections, one titled "Mind-Renewing Memory Verses" and one titled "Chapter Challenge." "Mind-Renewing Memory Verses" gives the reader several verses from scripture that not only fit the topic being discussed in that chapter, but that will also help the reader to implement the positive changes being discussed. "Chapter Challenge" gives readers a challenge to help implement the positive changes discussed in the chapter, such as journaling, making lists or other related exercises that will help the reader with the given topic. There are also questions at the end of each chapter that make the reader think about their own life, thoughts and choices and how the relate to the topic being discussed. Overall, I really enjoyed this book, as well as the author's style of writing. The topics covered are important ones and I do believe that almost everyone can not only relate to this book, but would find it helpful. I truly believe if everyone learned to be more positive and hope filled, no matter their circumstances, that we could make this world a much better place. And I think this book would be an excellent resource for anyone looking to make those changes in their lives. This is the best book I have read in some time on how to develop a more optimistic attitude. Miles provides practical instruction about how to develop a positive mind, leading to a more positive life resulting in unsinkable faith. She combines her own story with scientific research and biblical insights. Miles did not want to be a negative and bitter person as the result of an unwanted divorce after 25 years of marriage. She began to talk with Jesus. She realized she could not change her circumst This is the best book I have read in some time on how to develop a more optimistic attitude. Miles provides practical instruction about how to develop a positive mind, leading to a more positive life resulting in unsinkable faith. She combines her own story with scientific research and biblical insights. Miles did not want to be a negative and bitter person as the result of an unwanted divorce after 25 years of marriage. She began to talk with Jesus. She realized she could not change her circumstances but could control her thoughts through the power of the Holy Spirit. It changed her life. I was impressed with the lessons she shares. She emphasizes being aware of our thoughts, something many ignore. She writes about strongholds of negative thinking and how to combat them. She offers great strategies to help us put our faith in control of our mind. She reminds us we need to be alert to the reality of spiritual warfare too. This process was not easy for her yet she knew she had the tools from God. She developed the strategy she shares with us. She includes great questions to ask and verses to memorize to replace negative thoughts. She suggests reading this book with a journal and I think that is a great idea. I highly recommend this book to those who want to take control of their negative thoughts. It will mean work but God has provided the tools and Miles adds a great strategy. For those ready to intentionally change their thought patterns, this book is a wonderful resource. I’ll be the first to admit it — I don’t have unsinkable faith. Though I’d like to think I’m tough, when the waters of life start to rise, I start flailing. Like Peter trying to walk to Jesus over the sea, my attention is focused on anything and everything that could go wrong. Consumed with negative thoughts and worse-case scenarios, my own doubts, fears, and insecurities weigh me down like a sack of rocks tied to my feet. It’s only when I’m gasping for breath and nearly gone under that I finally I’ll be the first to admit it — I don’t have unsinkable faith. Though I’d like to think I’m tough, when the waters of life start to rise, I start flailing. Like Peter trying to walk to Jesus over the sea, my attention is focused on anything and everything that could go wrong. Consumed with negative thoughts and worse-case scenarios, my own doubts, fears, and insecurities weigh me down like a sack of rocks tied to my feet. It’s only when I’m gasping for breath and nearly gone under that I finally remember to look to where my help is — Jesus. Our minds can be reshaped and remade! With Unsinkable Faith, Tracie Miles shows us that we already have the tools we need to change our thinking and renew our minds and live more peaceful lives. With work, we can find that unsinkable faith. Fortunately, all we need is already at our disposal. What are the two main tools to defeat negative thinking? Scripture and prayer. Miles makes the process clear through conversational language and repetition through various examples and scenarios. It’s a three step process – 3 R’s: recognize, reject, and replace. First, be aware of the negative/false thought or belief when it occurs. Next, compare what you’ve been telling yourself is “true” to what God’s word says is true. Reject the lie as contrary to God’s truth and, finally, replace it with words from scripture that will buoy you rather than pull you down. And by all means, pray for help releasing what you need to let go of. Miles is part of the Proverbs 31 ministry, and if you’ve read other books from Proverbs 31 authors, some of what you find in Unsinkable Faith will be familiar. And that’s okay, because it takes repetition to break down fallacies in our mindset and start to rewire our thinking. I believe Miles had this in mind when she structured her book. She uses three stories from different women to help illustrate her points with each chapter. At the end of each chapter, Miles hands over the oars and lets your “row your boat” and do the work. She includes prompts for “mind transforming reflections”, “mind renewing memory verses” from scripture for you to write down and commit to memory, and “chapter challenges” that ask you to take action or find practical applications for the skills you’ve been learning. Miles acknowledges that renewing our minds is hard work. Habits take time to break and we must recognize that embracing positivity is a lifestyle, a continued effort, rather than a destination goal that, once reached, blankets you with uninterrupted peace of mind. You’ll slip, you’ll slide, and you’ll fall. But remember to get back up, dust yourself off, and keep looking up. Ready to banish negative thoughts? What are you waiting for? Think you’ll fail? Miles knows we’re going to mess up. So in what is perhaps the most valuable section of Unsinkable Faith, she aims to help us avoid common traps she calls “whirlpools”. She lists ten of these hazards giving examples and explanations, then provides a lifeline from scripture we can use to stay afloat should we encounter any of these dangers. So, with a little reflection, you can close the book already equipped with some weapons with which to slay your own personal dragons! Verdict: 5 of 5 Hearts. A Valuable Guidebook to Transforming Your Mind and Strengthening Your Faith. 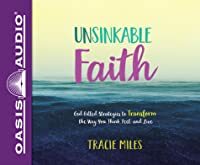 In Unsinkable Faith, Tracie Miles shows us that God’s word can help us overcome negative thinking and strengthen our faith even in the roughest waters. Unsinkable Faith offers hope and encouragement to a hurting soul. The book is full of stories about the author herself, along with stories of other women who have gone through storms and trials. I really enjoyed reading this book. At the end of each chapter there are Chapter Challenges, and the author lists several Bible verses of hope and encouragement to meditate on, write down and/or memorize. I really loved the verses the author chose to use with each chapter. The author talks about the way w Unsinkable Faith offers hope and encouragement to a hurting soul. The book is full of stories about the author herself, along with stories of other women who have gone through storms and trials. I really enjoyed reading this book. At the end of each chapter there are Chapter Challenges, and the author lists several Bible verses of hope and encouragement to meditate on, write down and/or memorize. I really loved the verses the author chose to use with each chapter. The author talks about the way we look at things in our lives can affect the way we think about them, and how that will be a positive or a negative result. I loved reading the stories of all the women in this book and how they dealt with their own situations. I highly recommend this book and it gets 5***** from this reviewer. I really enjoy reading this book. After a long day, I can read it and apply all the concepts to what is currently going on in my life. Everything Tracey talks about hit home in some way, shape, or form. I definitely recommend reading this to anyone who wants to rewire the way they think or to anyone who wants to feel inspired. So I want to start by saying the only reason I didn't give this 4 stars was because I dislike reading books that have devotional and assignments at the end of each chapter ... and NOT knowing this before the end of the first chapter. This will be better the second time I read it when I know how I need to read it. That being said I did love the content. It's a great spiritual read to reset your faith and transform your relationship with God. "Ships, whether huge barges or tiny sailboats, don't si So I want to start by saying the only reason I didn't give this 4 stars was because I dislike reading books that have devotional and assignments at the end of each chapter ... and NOT knowing this before the end of the first chapter. This will be better the second time I read it when I know how I need to read it. Have you ever been stuck in a pit of negative thinking and couldn't force yourself to change your thinking pattern? I have! 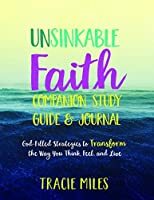 In her new book, Unsinkable Faith, Tracie Miles gives us the reassurance that we are not alone. When life happens, and brings us the not so pleasant circumstances that are beyond our control, we can easily become consumed with negative thoughts. The more we think, the more negative our thoughts become. The enemy of our souls will play games in our minds that can lead us to Have you ever been stuck in a pit of negative thinking and couldn't force yourself to change your thinking pattern? I have! 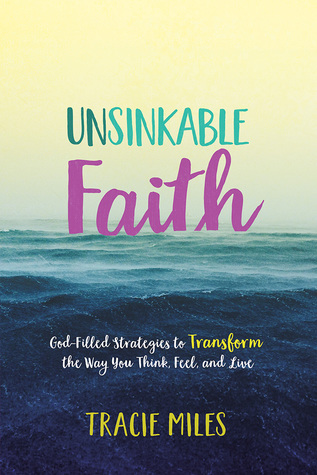 In her new book, Unsinkable Faith, Tracie Miles gives us the reassurance that we are not alone. When life happens, and brings us the not so pleasant circumstances that are beyond our control, we can easily become consumed with negative thoughts. The more we think, the more negative our thoughts become. The enemy of our souls will play games in our minds that can lead us to anger, frustration, anxiety, and even depression. The lower we become, the more he enjoys our despair. But when we take all of those negative thoughts captive, and turn them over to Jesus, He will replace them with His beautiful truths. Tracie has such a beautiful heart for helping women who need to be drawn closer to God. In Unsinkable Faith, she tells stories of her own life, and in the lives of several other women who have been stuck in the storm of negativity, feeling like they are about to sink. Tracie points us towards scripture that shows us how to be the Captain of our own ship by clinging to God's word, and allowing Him to transform our thoughts and our feelings to His truth's. He will rescue us from the raging sea, and guide us to the beautiful shore, allowing us to live our lives filled with Unsinkable Faith! At the end of each chapter, you will find Mind Transforming Reflections, Mind Renewing Memory Verses, and a Chapter Challenge, allowing you to go deeper in your study. This book would be a great book for group Bible Studies, or a study to do on your own. No matter how you choose to use it, I highly recommend this book to all! This is a book I will not put on a shelf, or in the closet, I will be referring to Unsinkable Faith often. I give Tracie Miles and Unsinkable Faith 5 Stars! All of us encounter stormy seasons in life, some more severe than others. In Unsinkable Faith, Tracie shares her story, along with stories from other women who have endured despite the storm. They not only endured, but kept a positive attitude along the way. Tracie gives practical applications for unsinkable faith with her “tools for the trip” including studying God’s Word, prayer, strategies for transforming your thinking, and a challenge at the end of each cha All of us encounter stormy seasons in life, some more severe than others. In Unsinkable Faith, Tracie shares her story, along with stories from other women who have endured despite the storm. They not only endured, but kept a positive attitude along the way. Tracie gives practical applications for unsinkable faith with her “tools for the trip” including studying God’s Word, prayer, strategies for transforming your thinking, and a challenge at the end of each chapter. As storms come up in my life, I focus on the storm, not Jesus. I read this book to learn how to have that kind of faith where I don't even look at the storm. This book delivered! It showed me the areas where I was sabotaging my walk with Jesus and my faith. I'm so glad I read this! A challenging and helpful book looking at ways of realigning negative thoughts and replacing them with biblical truths. A short read but plenty to think about. I absolutely love this book. It is filled with enlightening and practical information. It helps you dig deeper into God's word to gain unsinkable faith. This helpful book is packed with good advice about how to get rid of old habits of negative thinking, which will transform not your circumstances but how you see them and cope with them. Recommended. This book had wonderful ideas on how to focus on the positive in every situation. It can make a difference in your life! A very motivating read! If you struggle with negativity this book is a must read!!! Help noticing your negative thoughts, so you can take them captive, and replace them with God’s truths. “Unsinkable Faith” is a practical book about changing your negative thought patterns with positive thoughts with God’s help. Tracie has written a wonderful book full of information regarding negative thoughts and the effects they have upon us. She also gives real life examples from her own life and others in how the negative thoughts were affecting them and how they took those thoughts captive. Help noticing your negative thoughts, so you can take them captive, and replace them with God’s truths. Have you ever struggled with negative thinking and felt like you were unable to change that pattern of behavior? It is easy to become consumed with negative thoughts. The more we focus on them, the more the cycle continues. Miles’s latest strives to help the reader break that cycle by taking the thoughts captive and turning them over to Jesus. The key is to focus on Jesus’ truths instead of what the enemy is telling you. Two powerful tools are required: God’s Word and prayer. Miles’s book shows p Have you ever struggled with negative thinking and felt like you were unable to change that pattern of behavior? It is easy to become consumed with negative thoughts. The more we focus on them, the more the cycle continues. Miles’s latest strives to help the reader break that cycle by taking the thoughts captive and turning them over to Jesus. The key is to focus on Jesus’ truths instead of what the enemy is telling you. Two powerful tools are required: God’s Word and prayer. Miles’s book shows practical ways to deal with negative emotions. There are numerous stories, by the author as well as other women, which are likely to be very relatable to the reader.